Our bold and colourful Solomon & Sheba scatter was delivered last year to the lovely Gwyn Slade, our newsletter competition winner. The rest of the scatters in the Solomon & Sheba range have filled up our storefront and are waiting to brighten up many a home. Gwyn Slade, our newsletter subscriber winner with her Solomon & Sheba scatter. We thought it may be fun to play around with a couple of ideas on what decor items you could pair with our Solomon & Sheba scatters and decided to get all our complimentary decor items from Mr Price Home. Prices have been rounded up to the nearest R10 for your convenience. This board should also give you an idea of what we mean when we refer to a curated decor collection, or Decor-In-A-Box. Needless to say, this Decor-In-A-Box board and range is inspired by Solomon & Sheba: Raw African beauty meets the luxuries of the East. The plain design of this original Solomon & Sheba scatter is descriptive of the colorful caravans of people, offset against the endless rich plains of their desert as the Queen of Sheba was likely to make her way from Ethiopia to Israel to meet King Solomon. #4 Desert Caravan Scatter from Tassels & Tigers Interiors' Solomon & Sheba range. Linen Look and Genuine African Dutch Wax Print Scatter with Feather Inner. Size 45 cm x 45 cm, retailing at R540. 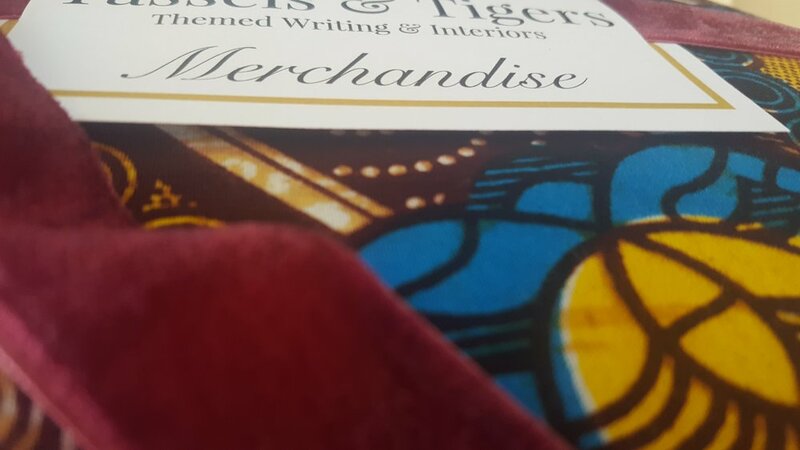 Buy it now on the Tassels & Tigers Online Store!